I'll be honest: From a comedy standpoint, nothing in this mailbag will remotely approach Sly Stallone's sparring session in "The Contender." That was like a gift from the Comedy Gods. What a man, what a moment, what a show. I haven't been delighted by a TV show like this in eons. More on this at another time. Q: This is what I don't get about why the guys who Jose Canseco says took steroids don't file lawsuits. If somebody writes a book and goes on "60 Minutes" and says, "I helped Bill Simmons plagiarize some articles when we were working together at The Crusader," wouldn't you file a lawsuit? No lawsuits yet? Maybe Canseco is telling the truth. SG: In a heartbeat. Take Raffie Palmeiro, for instance. The guy has made a crazy amount of money over the course of his career, probably in the neighborhood of $50 to $60 million. We already know that Canseco is pretty much broke. So if Palmeiro was innocent, why not hire a high-powered attorney and blow Canseco out of the water? I would think that any of these wrongly-accused players would be reacting like Harrison Ford in "The Fugitive" right now  risking their lives to clear their names. And yet none of them has done anything. Makes you wonder. 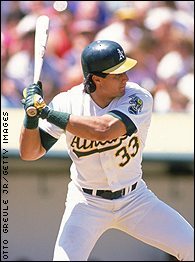 (One other note on Canseco: I thought he made up most of this stuff to sell the book; but after watching him on Bill Maher's show last week, I realized that Canseco isn't smart enough to think two moves ahead in a game of Connect Four, much less come up with a master plan to bring down baseball and make some cash in the process. All things considered, he could be the most memorably dumb athlete in sports history. He's just devious enough to be dangerous, but his stupidity makes it impossible for him not to consistently say and do the wrong things, only he has no idea that he's such a moron. Or maybe he does. It's almost like he's had some sort of head injury. Honestly, I'm fascinated by him. The fact that nobody has given him a reality show yet actually makes me angry  he's like a cross between Jessica Simpson, Carlo Rizzi and Tito Santana. Q: Please tell me they are televising the Congressional steroid hearings in which Jose Canseco and other players will be testifying. How amazing would it be if Canseco's testimony went the way of the hearings in "Godfather II." Canseco is about to be sworn in, looks around the crowded room and remarks, "There's more people than a ballgame in here." Just then he looks to the door and sees Bud Selig walk in with a piercing look in his eyes, and sees his brother Ozzie Canseco standing next to Bud. When it comes time for Jose to be the rat everyone knows he is, he replies, "I don't  I never knew no steroids. I got my own supplements, Senator." SG: Since I have nothing to add here ... I mean, did you SEE Sly Stallone sparring last night? Why not go the whole nine yards and have Burt Young and the bald guy from "Rocky IV" in his corner? Is there going to be a training sequence next week where he climbs a 45,000-foot mountain in Russia? Seriously, he knows he's not a real boxer, right? Can we get a definitive answer on this?